IT'S NO SECRET THAT I AM PASSIONATE about recording family stories. But what is the best way to preserve and share them? In spite of the wonders of the digital age, I am still a believer in print. There is something magical about holding a tangible object in your hands, words and photos imprinted on a page. No matter how big or small your storytelling project may be, I think that there is value in having a hard copy to read yourself and share with family members. In 2017 I decided to write the story of my 2ndgreat-grandmother, Renate Fooken Pedersen. She died in childbirth in Sims, North Dakota around 1901, but we had no records to back that up. A few years ago, I obtained a photo of her from a distant cousin; she stands outside in a muddy farmyard, tenderly holding a baby, and gazing out to the viewer. Her photo has sat on my living room side table for many years, and every time I looked at her I wanted to know more. My quest was to piece together the story of her life as best I could, using her photograph as a jumping off place. I spent several months doing just that, weaving together the facts I discovered into a non-fiction narrative essay, and when I finished writing her story, I wanted to share it with my family members. I chose Blurb.ca as my self-publishing choice and was pleased with the results. My writing was essay length with photos, and so a 7 x 7 inch photo book fit my needs exactly. Order one test copy. Before spending a lot of money on multiple copies, order a test copy to make sure that everything appears how you want it. It is possible to download a draft PDF version of the book, but I find it easier to find layout mistakes when it is bound. Save money.Take advantage of Blurb’s frequent promotions to get discounts or free shipping. The code can usually be found on the top banner of their website and you just type into the Promo Code box when you place your order. Download the free software. There is an online platform to work from, but I found it much more stable to download the free software and work directly on my laptop. Look at sample projects. I get so inspired by seeing other people’s creativity. Check out sample projects on the Blurb site; I guarantee that you will get ideas that you never thought of for layout and design. Small details make a big difference in appearance. Look at a similar professionally published book when making decision about font, justification and margins. For my Remembering Renate book I used Garamond font and justified the text. Copy and paste into the software. As tempting as it is to create in the actual software, it is much easier (and safer) to create a final draft in your favourite word processing software and then copy and paste it over in small batches once you are done editing. If you do need to make changes, don’t forget to save them in both places. Include sources and footnotes. I am a strong believer in the importance of including citations in family history writing. Not only will your reader know that this is not a work of fiction and be able to go to the original source, but YOU will also have a record of where the information was found. Blurb does not have an automatic way of inserting footnotes, but my work-around is to manually type in the numbers and shrink the font like this: Then, at the end of the book I copy and paste each of the sources in from the word document. For a longer book you may wish to include the sources at the end of each chapter. It’s a bit painful, but worth it in my opinion. Make it available for online purchase. The wonders of print-on-demand mean that you don’t need to order 500 copies and try to collect money back from family members. You can make the finished book available online, let family members know, and they can pay online and order it directly from Blurb (or Amazon if you prefer). It will get shipped directly to them and you are not on the hook for thousands of dollars. Use the Help Centre. There are challenges that you may encounter as you create your book. If you have a question, I can guarantee that someone else had the same one too. Search the Help Centre for tutorials and solutions. When I received Remembering Renate in the mail, I was so excited. It is the best feeling to open up your package and seeing the final tangible product of all your research, writing, and design. Let me know if you publish your family’s stories and how you decided to do it! YESTERDAY AND TODAY WERE SNOW DAYS in what otherwise would be a very mild winter for us in the Vancouver Lower Mainland region. Schools were closed, and many people worked from home to avoid the roads and backed up transit. I just got back in from clearing off my car and re-parking it in front or our house (it had been ‘stuck’ in place down the street for the past few days). As I worked, I heard children’s delighted screams as they played in the snow and slid down the hill at the park. It reminded me of snow days from my own childhood. I grew up in Powell River, and have glowing memories of donning a snow suit and sliding down the hill at Sunset Park on crazy carpets and toboggans. We made snow angels and threw snowballs, coming home with rosy cheeks. One year when I was about seven, long, clear icicles grew from the eaves of our house. Dad snapped them off and we sucked on them like popsicles. They didn’t taste very good, but it was fun. 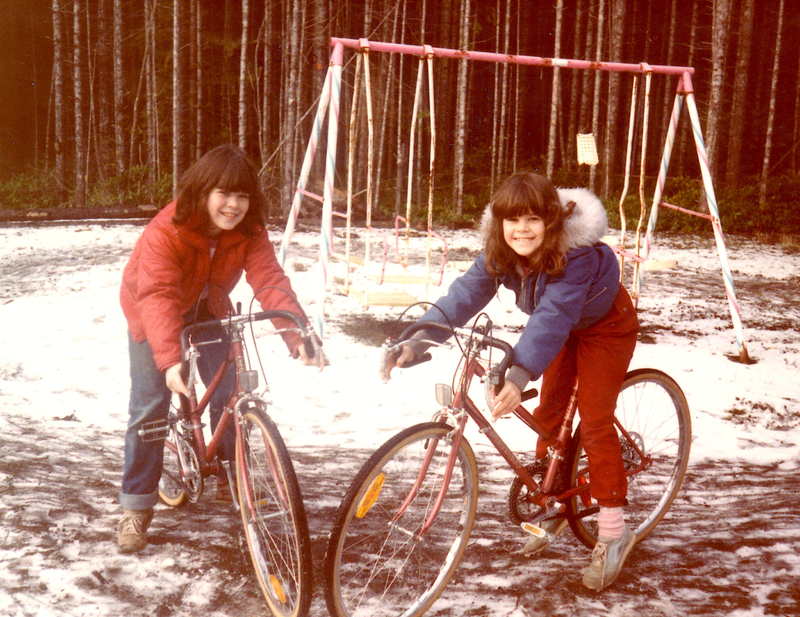 For Christmas when I was about 11, my sister and I received matching ten speed bikes for Christmas. We couldn’t wait for Spring, so created our own track in the back yard and rode around and around in the snow for hours. When I was 16, my dad helped teach me to drive, and a snow day was an opportunity to learn. Dad brought me and my sister to an empty parking lot at the old Brooks School and showed us how to get out of ice skids by turning the steering wheel into the slide, rather than jerking it in the opposite direction and hitting the brakes, a normal reaction and which would cause an accident. Not only did he show us, but he made us do it while he was sitting in the passenger seat. We became comfortable with having the car get out of and then regain control. This skill has helped me avoid several accidents over the years. When I was at university I worked as a late-night janitor, cleaning the faculty offices and classrooms on campus. One winter night I drove home at 2 a.m., turned left onto my Provo street, and found my car sliding hopelessly towards the deep rain gutters. I remember thinking that there was nothing I could do, but I let up on the brake like my dad taught me, and the car came to a stop and stalled right on the edge of the gully. I carefully backed up and drove the remaining few meters home, shaken but safe. Another time right after university graduation, I was living and working back in Powell River. I rented a basement suite in a house south of town on Byron Road. I made it up the first hill, but when I was turning right to go up the second hill, the loss of speed caused me to lose momentum. I started sliding backward towards a forested embankment on the opposite side of the street. I had the idea to quickly change gears into reverse, cause the car to slide around so that I was facing back down the first hill, and quickly change into drive to stop the slide and start going down the hill. It worked! I was shaken but managed to park at the bottom of the hill and decided to walk up and down the kilometre or so until the roads were better. Although there is something fun about being out in the snow, there is also something peaceful about cozying up inside to watch the flakes come down and read a good book. ​Writing prompt: How about you? What are your snow day memories? I AM DRAWN TO THE PAST. Although my father’s parents were both deceased by the time I was 11 years old, I can still map out the layout of their home in my mind: the black flagstones in the entranceway where I gave untutored tap dance recitals in my black patent shoes, the sliding screen door that grandpa walked through by accident (accompanied by some very choice words not fit for small ears), and the piano with the cushioned bench that I have in my home now; I loved to pretend that I could play elegantly just like Grannie Inkster. Perhaps the fact that my beloved grandparents died when I was so young impressed on me the fragility of a life, the transience of unpreserved stories. As a teenager and young adult, I travelled to Duncan, BC and interviewed my great-aunt, neighbours, and childhood friends of Grannie. One of them gave me the photo above; Peter had transferred from Nanaimo to work in the Nanaimo Duncan Utilities office while native Duncanite Kay worked next door at Fletcher Music. I also met with a man who had served overseas with Grandpa Inkster in WWII in No. 16 Canada General Hospital Army unit. He provided me with photos, memorabilia, timelines, and most precious of all: stories. A passion for stories has stayed with me and sharing these glimpses into the past brings me joy. Join me as I memorialize some of my family story adventures and as I share how you can do the same.